Two researchers working in France report the creation of a nanowire transistor that could be scaled down to to power the microprocessors of the 2020s, IEEE Spectrum reports. 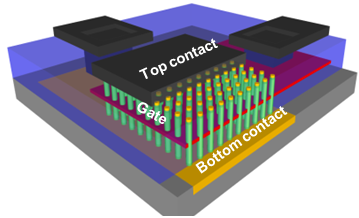 It consists of an array of 225 doped-silicon nanowires, each 30 nm wide and 200 nm tall, vertically linking the two platinum contact planes that form the source and drain of the transistor. Besides their narrowness, what’s new is the gate: A single 14-nm-thick chromium layer surrounds each nanowire midway up its length. “The advantage of an all-around gate allows the creation of shorter gates, without loss of control on the current through the channel,” explains Guilhem Larrieu of the Laboratory for Analysis and Architecture of Systems, in Toulouse. “We demonstrated the first vertical nanowire transistor with such a short gate.” An all-around gate will be a must if gate lengths are to get smaller than 10 nm, he says. In that scheme, “the size of the gate depends only on the thickness of the deposited layer; there is no complicated lithography involved,” he adds.